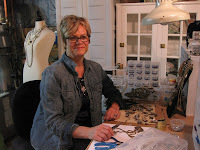 The jewelry adventure of Gail Vassiliades, jeweler from Northport, started relatively recently. She bought a beautiful necklace with a key and crystals. 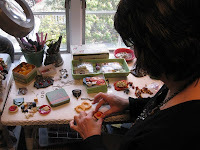 It was expensive and Gail was mad with herself for spending money on something, she felt, she could make herself. She was right. 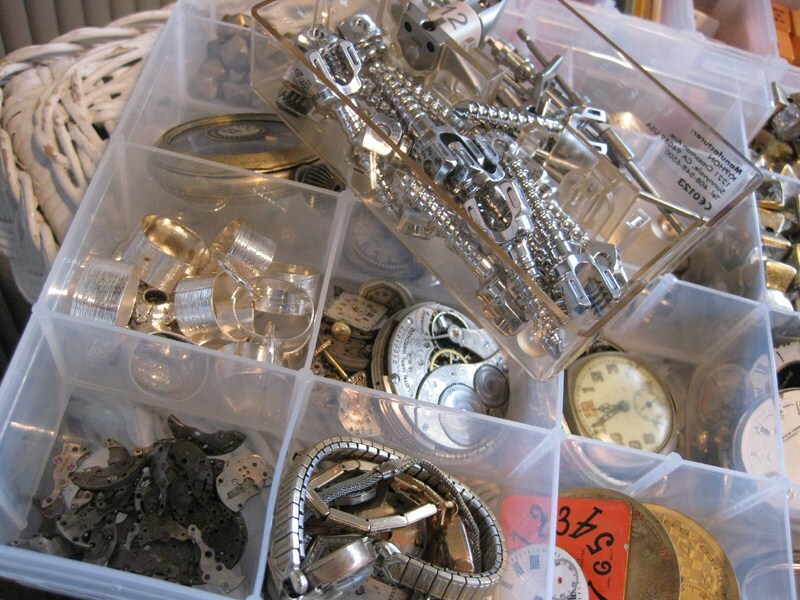 In addition to inheriting her father's toolbox filled with interesting looking items - gears, screws, metal parts of all colors and shapes, she also inherited his manual dexterity, her father was a machinist. 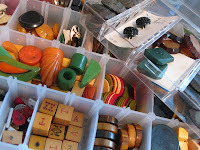 From her seamstress aunt she inherited a collection of buttons going back years. 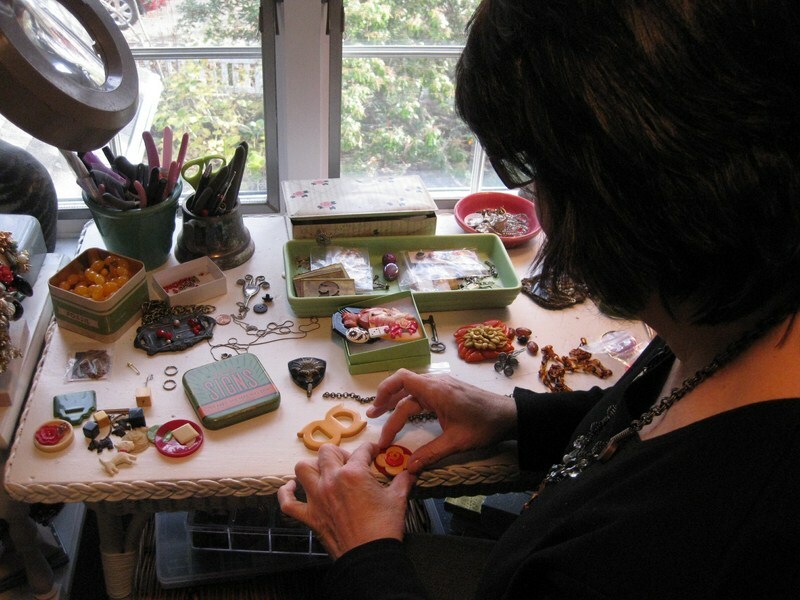 Gail started looking for everyday objects, buckles, cloak clasps, dress clips, dominos, keys, watch parts, that could be incorporated into a piece of jewelry. 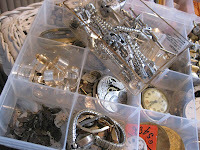 She scavenged at yard sales, bought parts on Internet or at antique shows. Her nurse friends gave her some decommissioned surgical screws yet to be creatively re-purposed. 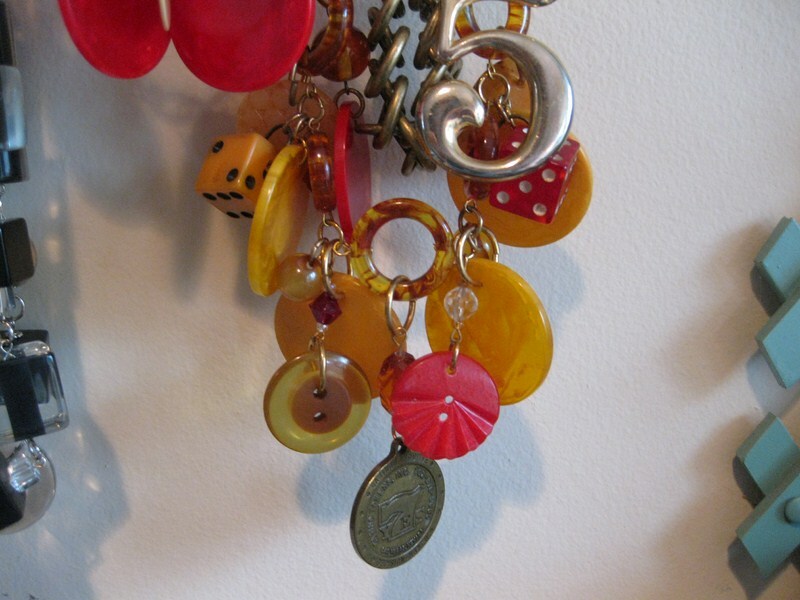 Gail has an eye for objects - her parents collected pewter and landscape paintings, she collects furniture, pottery, hats, fabrics, and hand tinted photos by Wallace Nutting and his contemporaries, among many other things. 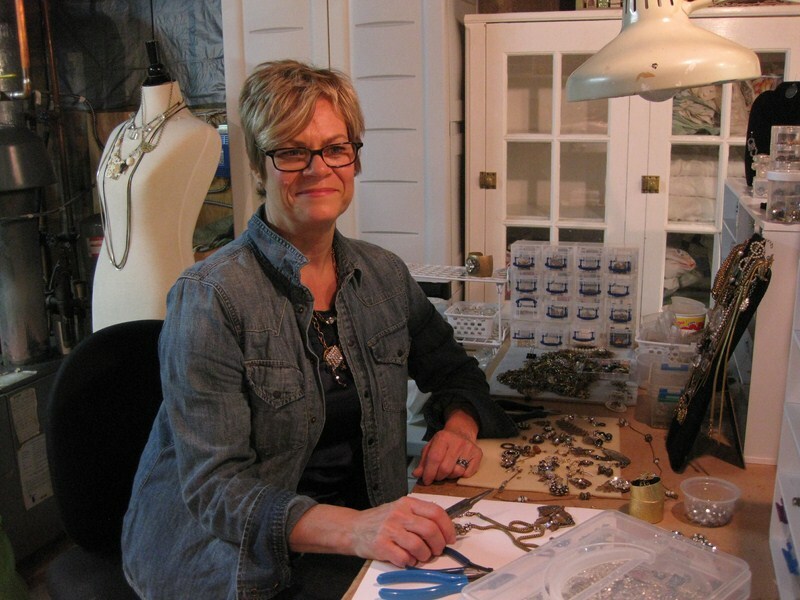 Gail has formal training in art, art history, and advertising design. She always wanted to do window displays and she got her wish partially answered. For the last 20 odd years she has worked at Macy's in visual merchandising which spans from arranging display color schemes and signs to the flow of items on display. 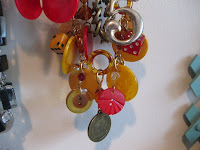 Her sensitivity to color is great and she uses it well in her work. Lately she tends to pick brighter hues with Bakelite elements fulfilling the need beautifully. Every piece she makes starts like a puzzle. She plays with the elements a lot to see if they work together. After a piece is finished she will wear it and monitor people's reactions to it. For Gail, jewelry making is a very enjoyable process, she works with interesting and pretty things. The process is also made pleasant by her choice of the studio, she designated a private upstairs alcove with a full window over her desk, it gives her not only the natural light within but also a view of trees outside. 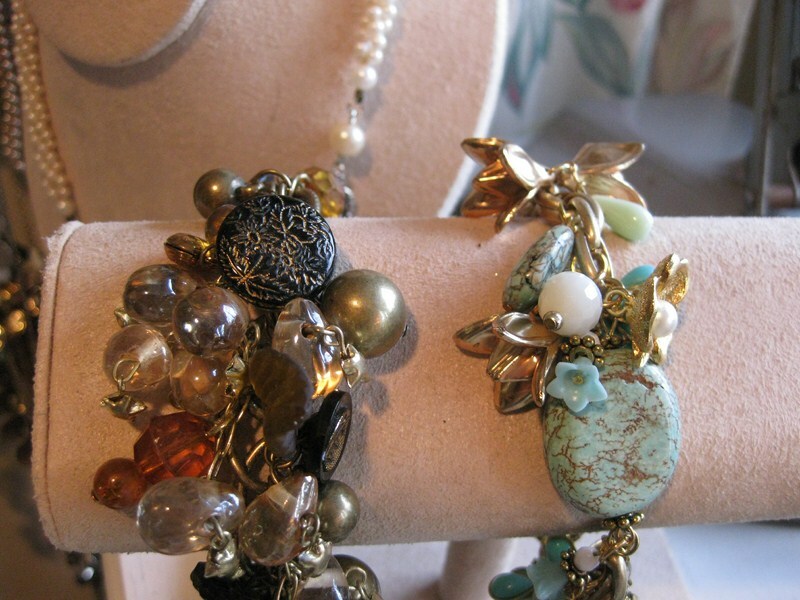 You will get a chance to see more of her jewelry and meet Gail in person at the Jewelry Extravaganza on December 3rd, 12 - 3 pm at Think Long Island First in Oyster Bay. Debra Warlan, jeweler from Huntington, created her first memorable jewelry for her own wedding. 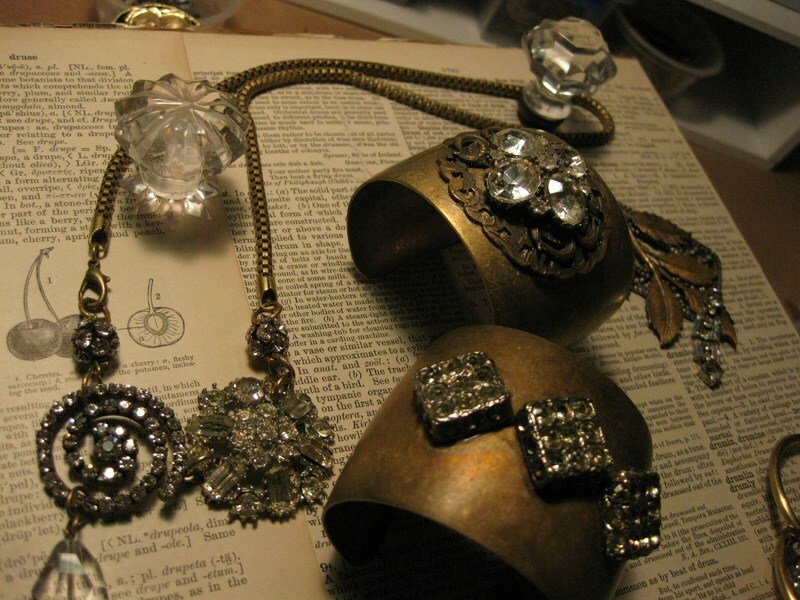 She still has the cherished pieces in her collection. Many years of various artistic endeavors followed - a degree in illustration from Fashion Institute of Technology, degree in art education, teaching engagements, commercial textile, trim and ribbon design, toy design, painting on furniture, a recurring, annual project of painting stage sets for a summer art camp. She is very fond of the art of assemblage, three-dimensional compositions of varied media, and has a number of her own framed works in the studio. Debra turned to jewelry at another momentous occasion - a beautiful necklace, designed for her daughter's prom and greatly admired by all, inspired Debra to focus more on her jewelry making. In the last couple of years she experimented with various esthetic approaches and techniques until she developed her own, highly recognizable style. 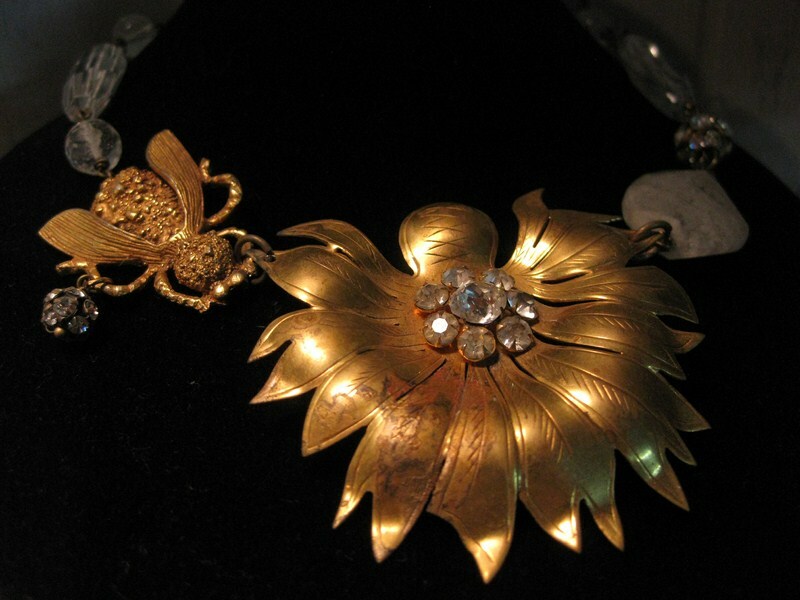 Debra's jewelry will usually have a brass chain, sparkling rhinestones and/or crystals, sometimes an element with a distinct green patina. She finds/buys older pieces or new items and 'antiques' them to a great effect. She frequently adds some nature related themes - birds, ferns, shells. 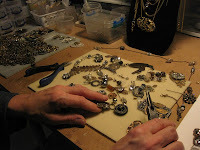 She starts with a central piece and then wires or links in additional matching elements. The effect is well balanced, meticulously executed and beautifully presented. 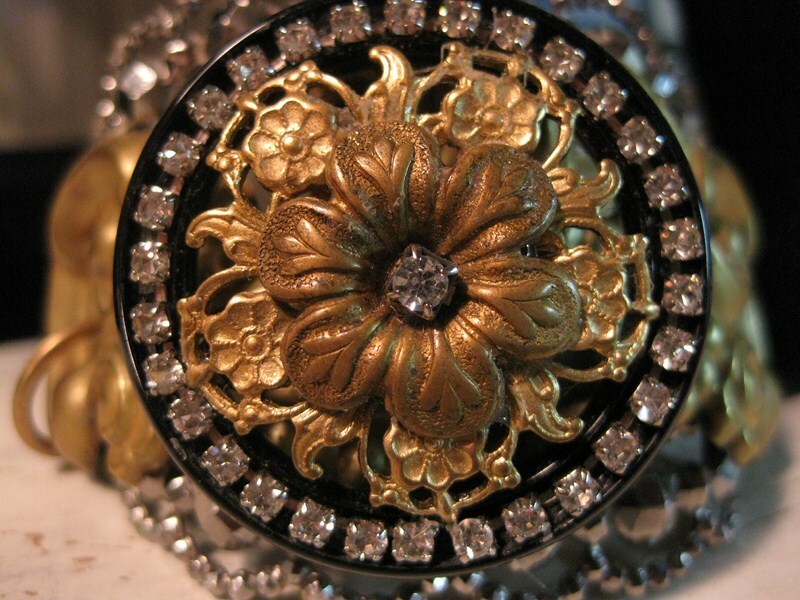 You will get a chance to see more of her jewelry and meet Debra in person at the Jewelry Extravaganza on December 3rd, 12 - 3 pm at Think Long Island First in Oyster Bay. 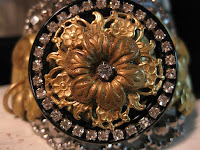 For more information about Debra visit her recently relaunched website DeeMaake.com. 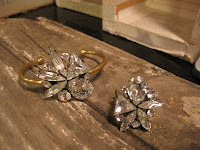 A great chance not only to admire work of the very accomplished local jewelers but also to meet them in person. It's always interesting to learn about the creative process and technique chosen for a piece. 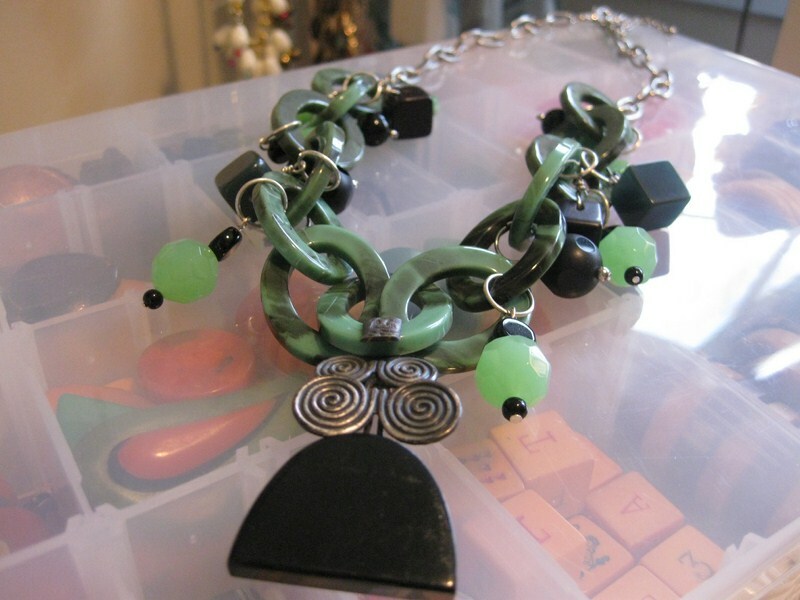 The jewelry represents many different styles, from sterling silver chain mail and vintage to fused glass and lampwork, with various esthetic approaches from the very classic to modern if not cheeky. 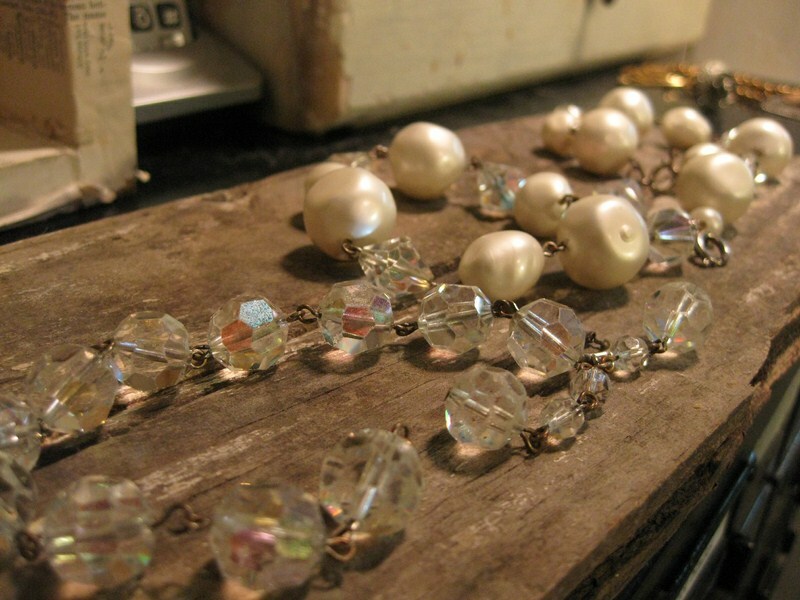 What is there not to like about jewelry? Particularly if it is both beautifully designed and executed with skill and care. Please join us at Think Long Island First at 36 Audrey Avenue, Oyster Bay, NY, on December 3rd, 12 pm - 3 pm. It's a free event, open to public.